1. What is the USP of Bizowie and is it suitable for mid-size or large enterprises? At Bizowie, we believe the future of ERP is at the intersection of flexibility and usability. To succeed in a global, highly competitive market, mid-market manufacturers and distributors need a robust, feature-rich software solution. But while the legacy behemoths are powerful, they lack the intuitive user experience customers have come to expect from modern software products. With Bizowie Cloud ERP, we’ve combined a full-featured and flexible solution with what we feel is the best user interface on the market, making it easy to implement and pleasing for users to work with on a day-to-day basis. 2. How do you compete with big giants like SAP, Oracle ERP, Salesforce? Our differentiation to end-users is based entirely on superior product. When prospective customers watch demos of competing solutions and compare them with a demo of Bizowie, they can see first-hand how flexible, user-friendly, feature-rich, and fast our product is. And with value-add modules – including shipping, warehouse management (WMS), B2B customer portal, e-commerce integrations, and time and attendance – that aren’t provided by many of our competitors, Bizowie can provide even more ROI right off the bat, with no third-party software required. For implementation partners, the advantage is even simpler. With Bizowie’s advanced customization features – allowing easy set-up of workflows, reports, printed documents and labels, custom fields, metadata, and even integrations – implementers can deliver truly tailored solutions in a fraction of the implementation time needed for competing systems. And since these features allow customization without custom code, end-users are able to seamlessly take advantage of system upgrades without hiring programmers. 3. Do you offer cloud-based ERP solutions as well? Bizowie Cloud ERP is a 100% cloud-based, software-as-a-service (SaaS) product. Unlike the “fake cloud” offerings provided by many of the legacy ERP vendors today, Bizowie is a true hosted, web-based cloud application, accessible from any device with a web browser – Mac, Windows, Linux, mobile devices, etc. 4. With so much consumerisation of IT, how do you ensure the right UX (user experience) is provided to your erp user? Providing a great user experience is critical for a modern ERP vendor. Today’s business software is designed to be simple for users to learn and intuitive to work with on a regular basis. Applications like Google’s Gmail come with all the power and feature-set of their predecessors, but without the lengthy user manual. At Bizowie, we believe that people should expect no less from their ERP vendor. To this end, we’re constantly investing in our product to provide the best possible experience for each of our users, with innovative features like our responsive, mobile-friendly design (which provides full ERP functionality on mobile devices without limited “apps” or mobile sites) and our contextual user interface features (which show users fields and elements relevant to their configuration and workflow, instead of dozens or hundreds of options that may not be relevant to their implementation). The “soft” side of ERP implementation is just as critically important to the user experience. We’re very selective with the implementation partners we work with, only aligning ourselves with partners with proven track records, and both business and technical acumen. This ensures that the system as implemented will allow customers to meet their needs, and that customer staff will be well trained on the software, allowing them to better empower their end-users. 5. Which industry sector Bizowie prefers the most for an ERP solution? Bizowie works primarily with mid-market manufacturing, distribution, and e-commerce operations. Our customers span a wide range of verticals within those sectors, and our broad range of functionality makes us a perfect fit for mixed-mode operations that don’t fit into a “one-size-fits-all” mold. 6. Is Bizowie also flexible to integrate with third party software such as SAP , for example integrating SAP Distribution with Bizowie CRM? However, since we provide a full-featured suite of ERP functionality (including robust, GAAP-compliant financials and advanced manufacturing and distribution offerings), a built-in CRM solution, and value-add modules for B2B commerce, warehouse management, time and attendance, and more, it’s generally not necessary for customers to integrate Bizowie software with other ERP or CRM offerings. 7.What is the deployment time for Bizowie and how do you rate it in terms of cost effectiveness and providing clients ROI. Our software was designed to streamline the implementation process and make critical tasks like data migration and workflow configuration very straightforward. As a result, we find that the primary driver of implementation time is the customer’s ability to commit resources to the project. We’ve had small start-ups go live in as little as 3 weeks (which is obviously not the norm), and we’ve also had growing companies intentionally plan out a longer (~6 month) implementation to allow for employees wearing multiple hats. That said, our average is about 12 weeks from signing a contract to go-live. We’ve designed our pricing to be very straightforward – a customer’s entire price quote can be listed on one sheet of paper, without hidden fees or “gotchas”, which makes system comparison easy. Any customer can achieve nearly immediate ROI from an upgrade to Bizowie, whether they’re taking the next step from small business accounting software like QuickBooks, or making the switch from a legacy ERP implementation. This ROI can come in the form of improved productivity through automation of manual tasks, cost savings on outdated on-premise IT infrastructure, better customer experience through online ordering and faster PO processing, improved order accuracy through barcode scanning and other technology-driven QA initiatives, or all of the above! 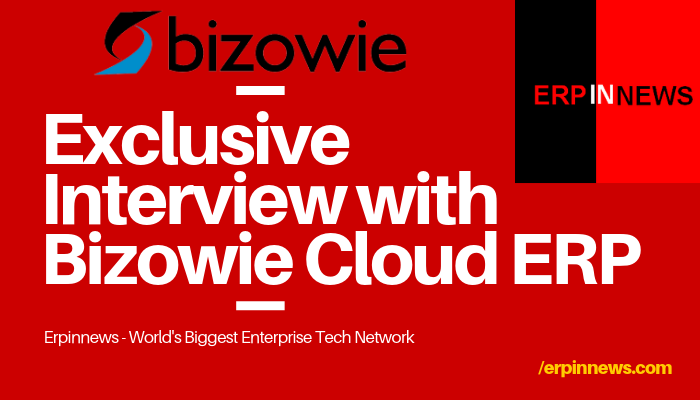 The post A Cloud ERP miles ahead of SAP in its user experience (Exclusive Interview with Bizowie Cloud ERP) appeared first on erpinnews.